I was a long term smoker. Over 10 years. I tried almost everything to quit, medications, cold turkey, patches, the list goes on and on. I was finally able to quit using electronic cigarettes. I can't make any claims about the effectiveness of e-cigs as smoking cessation devices, but I can say that they worked for me. Here is how to make one. 510 sealed battery connector - They can be a pain to solder so Madvapes offers prewired ones for $2.99 that I recommend. Horn Switch - $.89 they come in many colors and have been very sturdy for me with a nice clicky feel when pushed. 18350 Battery - $4.79 great battery, long lasting, fits into other vaping gear that you might have. So pretty... So very pretty. Battery Spring Plates - $.99 does exactly as advertised. Holds battery firmly, allows current to flow. You will also need some wire, solder iron and solder, a drill, and a box to put everything in. I used a box I made myself, but there is nothing stopping you from using something like a plastic project enclosure from Radio Shack. Here is a photo of the box I made. Ok, here are the ultra simple directions. 1. Drill a hole in your box that fits the Horn Switch. 2. Drill a hole that fits your 510 Connector. 3. Seat both the Switch and the 510 Connector. 4. Connect one wire from the 510 Connector to the Positive Battery Plate. That is the one without the spring. 5. Connect the other wire from the 510 Connector to one of the leads on the Horn Switch. 6. Attach a wire to the one remaining lead on the Horn Switch. Connect the other end of that wire to the Negative Battery Plate. That is the one with the spring. 7. Mount the battery plates in the box so they are stable. 8. Insert the 18350 Battery. 9. Close up the box. 10. Enjoy. Screw in your favorite clearomizer, or pick up some Blu Cig Refill Cartridges from your local convenience store. Push the horn switch to vape. 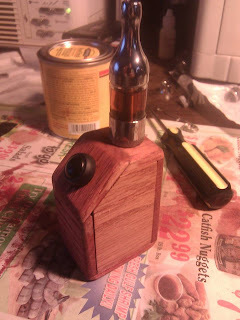 When it stops producing vapor, you need to charge the battery. And that is it. Believe it or not, an ecig is no more complex than a flashlight. Now get out there and get creative! The profits and dangers of electronic cigarette utilization are uncertain.Some proof recommends e-cigarettes may be more secure than smoking tobacco items, and perhaps as sheltered as other nicotine substitution items yet there is deficient information to draw conclusions. They convey a danger of enslavement in the individuals who don't as of now smoke, and may advertise continuation of dependence in the individuals who as of now smoke. With the spread of e-cigarette use, unintentional nicotine harming has expanded, particularly among kids, because of ingestion or skin presentation to e-cigarette liquids. Some of the e cigs coming out now look awesome, I always got my e cigarettes from a few vendors, but the best e cigarette in my opinion is the Kangertech Topbox its so amazing. Awesome you share your how to be you. I'm a Smoker too but it is easy to stop smoking just discipline yourself. I have visited a lots of site but you are the best that I have ever seen. I have also this related site. Thank you for the tips dude. It was awesome to know about it. I think it's bit significant use for custom color juul that I am using right now and it's quite less expensive just like what you did. Thank you! After reading this blog I felt like doing it but I am thinking I takes too much time and effort. I will just buy an Ecigarette since I like customizing Juul Skin . It is really hard to quit smoking. But if you really love yourself then you shall have all the courage to quit smoking and maybe find some alternatives like Vaping along with juul. Juuls are so fun to use since you can put some Juul Skins on it. Tack för att du tog dig tid att dela den här artikeln om e cigg. Efter att ha läst din artikel fick jag mycket information om de elektroniska cigaretterna och det löste många av mina tvivel. Fortsätt dela den här typen av artiklar här.